A travelogue of our vacation with photos. Thursday, 18 August 2005, marked the beginning of our "vacation" from the scheduled tour. The tour company transported the two of us to the Vienna airport in the late morning. (Everyone else had earlier departures.) When we checked in at Iberia Airlines, Michael was required to check his carry-on bag. And then we were told that our daughter Angelique had left a message to call. There was clearly a problem with communication because she sleepily reported that all was well when we promptly called her home at 4:30 a.m. When we checked in at American Airlines in Fort Smith on Thursday, 11 August, they asked us for an emergency contact person and phone number. A week later in Vienna, the Spanish airline Iberia must have seen that note, but got confused (in a major way) in translating its purpose. We first concluded that Angelique must have tried calling us at the hotel just after we departed for the airport about 30 minutes earlier. Since it was 4:30 a.m. in Dallas, we could only assume that it was an urgent situation. While it's bad enough that the airline alarmed us and we woke Angelique up so early in the morning, it is particularly annoying that the airline waited till after checking us in (and after insisting that Michael check his carry on) before telling us of the "emergency message." Had there been an emergency, we very well might have had to immediately make other arrangements to return to the States. Our flight departed about 1:30 p.m. We had to pay €10 each for a sandwich, small Snickers bar, and Coke Light on the plane to Barcelona. It was good, but too expensive. Our plane landed in Barcelona about 3:30 in the afternoon to partly cloudy skies and about 80ºF. We took a taxi to the Hotel Barcelona Universal. We were thrilled with the nice big room. The front desk told us they gave us a nicer room because of our anniversary. We had the second largest room on the floor according to the fire escape blueprint. The bathroom was at least three times bigger than in our hotel room in Vienna. And we had two big closets in a changing room. Our room was a quiet one away from the street on the 8th floor. We never heard any noise during our 4-night stay. We were fascinated by the light in the hallway outside our door that came on only when we got close to our room. And best of all is the price was great for such a hotel in Barcelona. The water from the tap in Vienna was very tasty. We found the tap water intolerable to drink in Barcelona. After unpacking, we walked just outside the hotel's front door to the Paral·lel subway station. Just three stops got us to Plaça de Catalunya at the north end of La Rambla. There we purchased 2-day passes for the Bus Turístic and a Barcelona Card with unlimited public transportation access for 4-days. We then hopped on the next tourist bus going along the south ("blue") line. 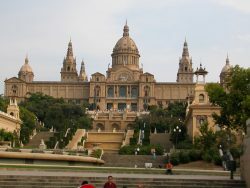 We rode past several interesting sites, including the National Palace, the 1992 summer Olympic stadium, and the monument to Christopher Columbus. 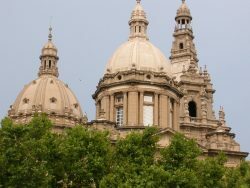 It was in Barcelona where King Ferdinand and Queen Isabella held a triumphal reception in 1493 for Columbus after his return from the New World. At Port Vell (pronounced "vay") we hoped off the bus at the mall where we found a nice restaurant. We sat at a table on the terrace as the sun was setting. Supper included the cold tomato soup the Spanish call gazpacho. (We thought the gazpacho made by Diane Woolly, Jeannie's sister, is tastier.) Jeannie then had grilled pork and Michael enjoyed a sampling of meats and seafoods of the region. We got on the next tourist bus at the same stop where we had earlier disembarked. It was too chilly now to sit on the open air top deck, so we sat inside where it much less breezy. It was too dark to see architectural styles, but the lights were pretty, especially at the fountains we passed. On returning to Plaça de Catalunya, we found the subway station and returned to the hotel. We walked a couple blocks on the street in front of the hotel to scout out possible places to eat breakfast on Friday morning, since we thought the hotel breakfast was a bit pricey at €13. Discover lessons about Christianity from ancient Pompeii.